As a fiction writer, reading poetry is always a lesson in sparseness and omission, getting down to the bare necessities of telling a powerful story. Pollock has many strengths, the first of which is his simple, visceral images. In the poem “Recessive Gene,” Pollock addresses mixed identity through a child who searches for belonging. After being told by other children that they all were Black on the inside he looks for his own internal blackness: “Dad had a pocketknife/ …That afternoon, I stole it./ Alone, behind the locked door/ I tried to scrape, as if fish scales/ the rosy skin from my forearms” (4). In both “The Frog” and “Killadelphia,” the poet uses rhythmic repetition to his advantage, mirroring the pace of city life and the sharp simplicity of childish anger. “Child of the Sun” again plays with race/ identity, and how that interacts with history, colorism. The narrator feels the weight of his difference as determined by other members of the family; how that will affect the way society perceives him. Pollock plays with form in “Longing as Hoppin’ John;” starting with the longest line first, then using shorter and shorter lines until the last line is a single word. My favorite poem of the collection, “Oya in Old City,” tackles history, time, and spirit. This poem ends with another powerful, succinct image : “I flung my almost white self/ into my mother’s embrace- that brown/ embrace I hoped would swallow me whole/ and spit back a boy four shades darker” (19). It is no surprise that this collection won the Cave Canem Poetry Prize for 2010. 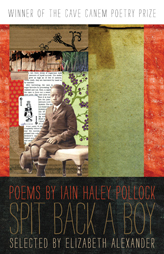 Iain Haley Pollock’s poems hum the blues, exposing deep painful truth as well as celebrating life’s simple pleasures.